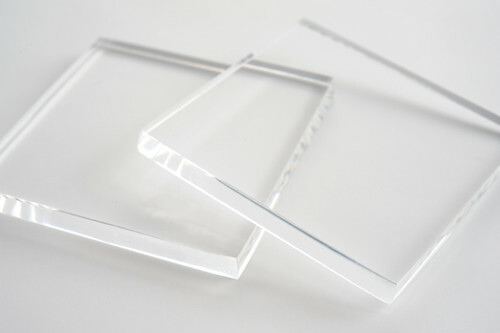 Clear acrylic sheet is commonly referred to as perspex sheet, is a high quality and versatile clear plastic sheet material that offers great strength and clarity. It is suitable for a wide range of applications and is very easy to work with. Clear acrylic sheet has a high level of light transmission allowing 92% of all visible light through the material creating crystal clear finish. Compared to glass acrylic has a greater level of optical clarity. This makes clear acrylic a great alternative to glass for glazing and aquarium purposes. KF Plastics has a large selection of stock sizes available. Ordering the cut to size option allows you to select just the size and dimensions you need without the need to purchase and store excess material. After dimensions are selected an updated price per custom sheet will be displayed. We offer a variety of edge polishing methods for our acrylic sheets. A standard polished edge will be either flame polished or laser cut, however we do offer Diamond polishing for those that want an almost perfectly clear edge. Diamond polishing is mainly used in awards, trophies and retail environments where the product will be in close proximity to the customers field of vision. Soften the edges of your acrylic sheets with beveled or rounded edges or radius corners. Clear acrylic sheet is half the weight of a glass panel of the same size and is more easily transported, installed and supported.